A section devoted to special requests and appeals for help and information. Does anyone out there know anything about this club? Club Historians recently received a request from Harry Barber about the Brownroyd WMC. 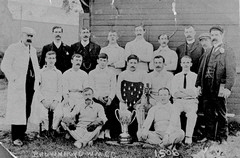 He has a lovely old photo (see below) of the cricket team there, which was taken around 1906. He believes that one of his relatives is in the picture- Walter or Thomas. Given the fact that the photo is more than a hundred years old, we know it’s going to difficult to find out anything. But if you know this club and perhaps had older relatives who used it, you might have some leads for us. Or perhaps you are a local historian in the Bradford area and are familiar with local archives. Please get in touch with us through the contact form! We will then be able to get back to Harry. South Yorkshire’s clubs in the 60s? “I am writing from Australia to ask is there anywhere I can look at old copies of the magazine that used to be in South Yorkshire called “Our Clubs”? “I am trying to track down a girl singer who worked the clubs in the early 60’s. I have forgotten her name but I will recognise it as soon as I see it. She had a limp but was a beautiful singer. She would be about 70 now. If I could see a list of girl singers who were around the clubs in the early 60’s I would be delighted. Does anyone have any old film taken in Working Men’s Clubs? Do you have any old film that your dad or granddad took in the local club lying around? Do you have anything stored away in a club storeroom somewhere collecting dust? Then if so, this is wanted! A small company in London, Kinolibrary, is trying to find some amateur film of working men’s clubs in their heyday, particularly the 1960s. They want to see what the members of clubs did as through the eyes/lens of members themselves! They are very interested in working class leisure as seen from the perspective of working class people themselves. If the film is in a useable condition and suitable for their needs, they are willing to pay a small fee. Club Historians is assisting them because we believe that there is a dearth of such home-made type of film about clubs available. We don't just want the professional documentary film but what the people made for themselves. Anyone out there remember the Stanton Club in Coventry or The Transport Club on Cambridge Street also in Coventry? Ann Garratt got in touch with Club Historians recently with a request which I am passing on here. I’m writing a memoir about coming to Coventry from Ireland in the late 50’s. One of the most enjoyable times we had in the early sixties was the outings we used to go on, organized by the Transport Club on Cambridge Street, and the Stanton Club on the Stoney Stanton Road. We would all go off to Skegness, or Whipsnade Park or Drayton Manor Park. I would be interested to hear if you have any material relating to these events or the Xmas parties that used to be organised for us. My memories although pleasant are sketchy and I would be interested in anyone’s recollections. June Fleetwood would like help with researching her family history, especially her fiddle-playing, tap dancing grandfather Tom RAINBOW. Does anybody recall hearing about him through their grandparents? Or remember his stage name? They performed on the Leicester club circuit including the Bond Street Working Man’s Club. June wishes she could ‘just wave a magic wand sometimes when I am researching my family history!’ That might not happen but Club Historians can perhaps work some of its own particular brand of magic and help out June. Please contact Ruth through the site and she will forward messages to June. Remembering the Bond Gate Social Club in Nuneaton!! Mal White, formerly of Nuneaton but now an Aussie, is hoping to make contact with any anyone who remembers the Bond Gate Social Club in Nuneaton during its hey days of the late 60's and early 70's. If anyone remembers the club and/or Mal and has memories to share please get in touch!